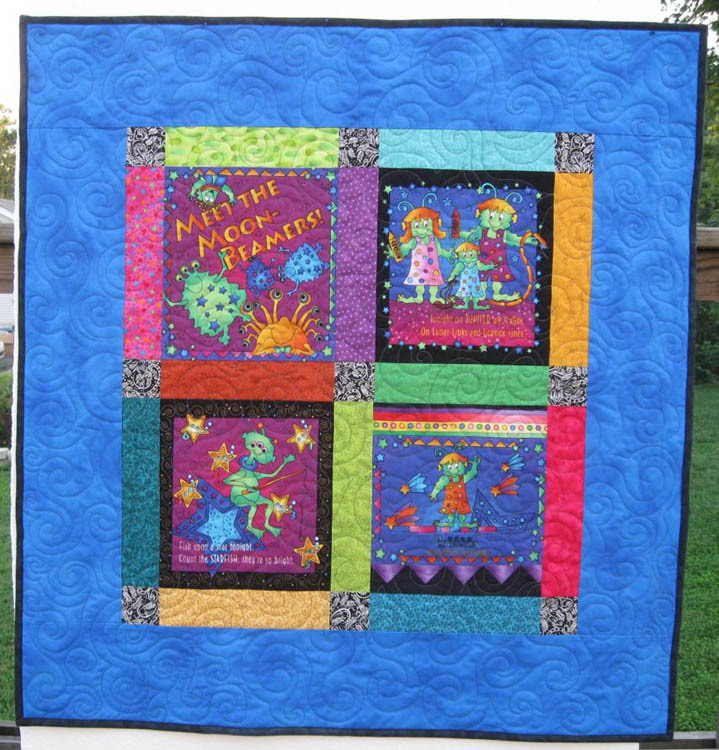 Cuddle quilt using blocks from a fabric book panel. Sometimes it's just nice to make a quilt for someone you don't even know. Pull out several brightly colored fabric scraps or a large print, use a basic block pattern, frame it with a coordinating border and there you have it! 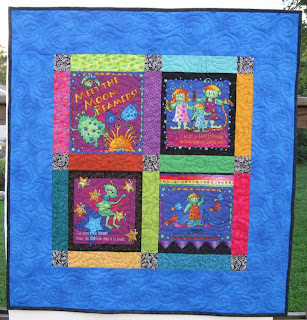 My quilt guild, the Choo Choo Quilters, supports a local children's organization by making and donating "Cuddle Quilts" (lap size and child size quilts) every year. At the September guild meeting, members submitted 15 more completed quilts toward the cause. The three shown here were my contribution. When I need to do some "therapy" quilting (no pressure, doesn't-have-to-be-perfect, for-the-pure-enjoyment-of-the-process kind of quilting) these are my go-to projects. I had two quilt tops that were completed at my guild's annual Cuddle Quilt workshop last month, and a top that had been basted for some time and was waiting in the "to-be-quilted queue." This was a perfect framework for an ad-lib free-motion quilting exercise. Left: A large repeat stripe serves as the center panel. 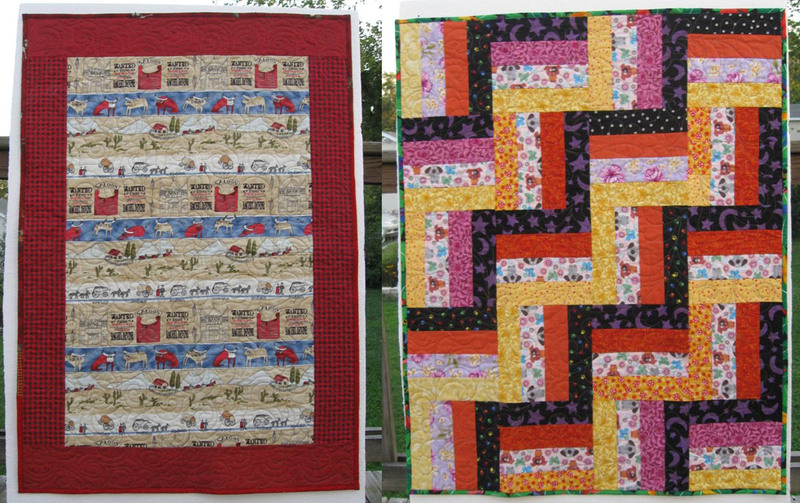 Right: A scrappy Rail Fence quilt. I don't mark these quilt tops. I take the quilt sandwiches (two were even spray basted), drop the feed dogs and just go for it—intuitively working out the stitching patterns as I make my way around the top. The bindings are attached by machine and they're done. As I tell my quilting students, Cuddle Quilts (charity quilts) provide a great opportunity to practice free-motion quilting. The fun, busy fabric prints will hide any wobbles or shaky stops and starts, and the recipients will love them all the same. Making these small quilts is relaxing and rewarding and more importantly, they will bring a smile and comfort to someone else.